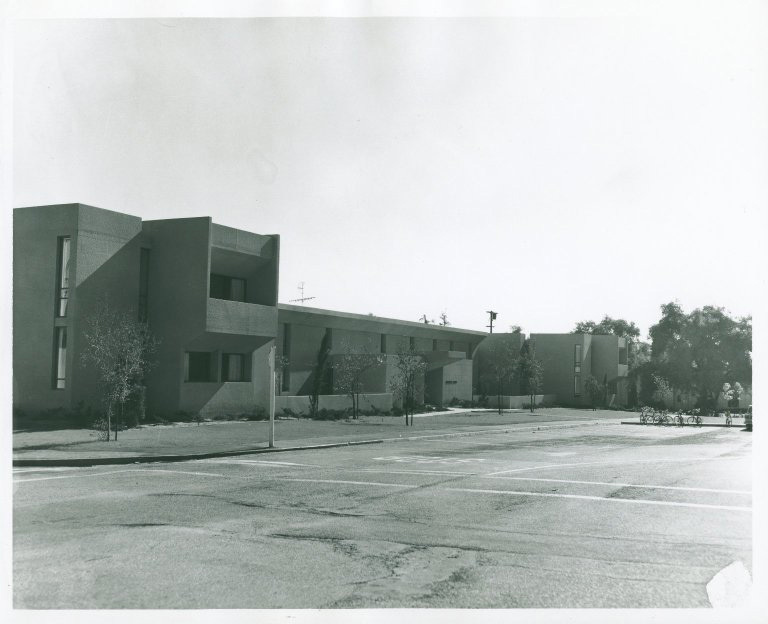 When Oldenborg Center was built in 1966, it was believed to be the first facility of its kind to combine a language center, international house, and coeducational residence in a single building. Although other institutions, Columbia and Berkeley among them, had international centers for foreign students, and many others held modest language houses, no other American college or university offered a dormitory designed for the practice and use of foreign languages. The idea of Oldenborg was developed by what was then the department of Modern European Languages and Literature and by Deans J. Edward Sanders, Shelton Beatty and Jean Walton, with the support of President E. Wilson Lyon. The concept was warmly received by Diederick C. Oldenborg, a retired businessman who had come to know Pomona College through Mr. Allen F. Hawley, director of alumni and public relations. Mr. Oldenborg was born in Denmark and raised in New York, he had been a world traveler whose goal as a philanthropist was to “strengthen communication and understanding among nations and thereby contribute to world peace.” Although a Yale alumnus, Oldenborg was attracted to Pomona by The Claremont Colleges consortium. Experience abroad heightened his interest in Pomona’s need for new foreign language and international relations facilities, and his gift of $1.1 million was, at the time, the third largest in the history of the College. The final cost of the building was $2,300,000. Oldenborg Center was designed to facilitate the development of language fluency and better understanding of foreign cultures and international relations, offering opportunities second only to an actual sojourn abroad. Construction began on October 2, 1965, and the dedication took place on October 18, 1966. The first students moved in on November 2, 1966. Mr. Oldenborg did not live to see the completion of the building, but Mrs. Oldenborg remained vitally involved in the Center and its programs until her death in December, 1984. The daughter of Mr. and Mrs. Oldenborg, Maisie Barber, and her family, have continued the family tradition of commitment to and support of Oldenborg Center. That first year Oldenborg accommodated 144 students, grouped into separate Chinese, French, German, Russian, and Spanish wings for men and women; the dining area was also divided into language sections. Today, language residents from China, France, Germany, Japan, Russia, Spain, and Latin America mentor students in the six main language halls, where they also teach intermediate and advanced conversation classes. Students can also study Swahili and Persian through a pilot self-instructional language program (SILP). Oldenborg’s dining hall is open each week that classes are in session and students, staff, and faculty from across the 7Cs attend its foreign language tables or Oldenborg Colloquia over the noon hour. The original Oldenborg concept, unique in American education at the time, insisted that meaningful study of language and international relations involve personal, day-to-day living experience as well as a strong and varied program of course work. Today’s Oldenborg, with its range of co-curricular and residential programs, remains true to that mission.